I have been asked to share our strategy on the forums. I do not post this for any reason except to help other servers and clans, and to say that it can be done. Tonight we had 51 of clan members lvl 210+ on, of which only 26 were solo logged, and we used this strategy and was effective with it. Our Main Tank DC'd at about 35% for about 15 seconds and our DPS was shaky handling the vines and poison puddles for the first time ever. If we had not had those issues we would be celebrating a kill with this strategy. As it was we got him down to 10% health at rage. This strategy came about because Krumz, Bob, Praetorian, Healer (Mabon) all believed that we were missing something and that a strategy could work. Between each of us we have came to this strategy. Our strategy is dependent upon leaving the South add up. For our DPS to be maximized this root must be the Caustic (poison) Root. It may be appropriate to arrange a time hours before the raid to kill the South Root until we get our root to spawn. Main Druids split responsibilities on Howling Winds, Bless, Bark, Abundance, etc. 3-5 other solo logged dps preferably rangers. The OT North group will have a few assignments. 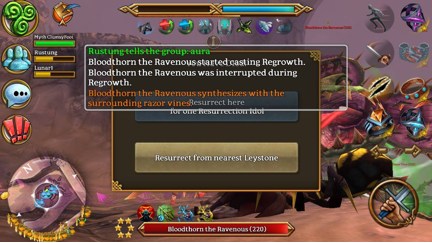 Unfortunately the message we are looking for to bash is in white letters “Bloodthon the Ravenous started casting Regrowth”. That happens exactly once every 120 seconds. So in theory you can set a stop watch to 110 seconds after the previous one and call out 10 and prepare for that message. The rest of the time the bashing warriors should be using EDL swords and hasted to help add DPS. The DPS warriors and rogues should be hasted and focusing on DPS. This assignment is pretty straight forward. Keep the tank alive. Before the encounter begins the druids must decide on a “Book” rotation. The boss only does Poison damage, Magic damage, and Chaos Damage. The EDL Book offhand ability is in essence one of our best heals for this fight. Druids need to have assigned who will be casting Abundance, Bless, Shield of Bark, and Magic Ward. Any druids that have Sanctuary is an additional bonus and if multiple druids have it make sure to not try to stack the spell. Support Rogue should keep smoke bomb and expose weakness on BT at all times. The tanks will be working from the west plat form. The tanks should be doing what tanks do but also watch for the message the bashers are looking for help bash regrowth. At 40 percent health the boss will randomly put a poison pool on one of the 4 platforms. This pool is big and deadly, if tank has enough posion resist it will be fine and druids will just have to slide north or south of the pool to cast heals on the tank. If tank doesn’t have much poision resist then reaction will be needed and you will need to move to the north platform where the dps toons are. You will be stationed on the north side of BT. Mages need to keep lures on BT at all time (if one mage wants to max slashing lure pm swee and he will provide an alt book.) There will also be 2 rangers assigned to keeping entangle on the BT. Rangers, keep sharpen weapons up on the group. Otherwise your job is to DPS. When the 5 star spawns your priority is to DPS the 5 star and kill it asap. The rest of the time kill BT. At 40 percent health the boss places poison pools randomly on one of the 4 platforms (North, South, East, West) react and reposition quickly if this effects you. The East platform will be offlimits as it will pull the South 5 star on you. Vines Group are dedicated solo logged players within raid whose responsibility is to kill the vines on spawn. By the map, a 228+ ranger will need to be positioned at blue dot (near the South-West vine), and another one at the pink dot on map (near the North-East vine). See below for Black Vine (South-East vine). Their sole purpose in life will be to kill their respectively colored vine (South or East vines) on spawn without aggroing the south add, and to kill the vine colored black in the picture when the Tank pulls the 5 star root. When the South-East vine spawns tell the tank to “Pull” in chat. When not doing that DPS the boss. The vines have a proximity reset mechanic that will not allow permanent damage unless you are close enough to the vine. Black vine is the only vine that cannot be killed without aggroing the south add. The South OT will be positioned on the south Radius of the raid. South OT will drag South Add so that black vine can be killed. Once it is killed, clear the area. OT south will release the add. The rest of the group needs to be have assigned positions on the remaining vines. The vines must be KOS. The DPS that has responsibility for the NE, NW, and SW vines should be rangers and the North and West vines dps can be rogues so that no one has to move very much in order to shift focus from DPS on boss to killing the vines. Each DPS toon should help with the vines next to them in either direction as killing the vines is one of the most important parts of the raid. When the 5 star spawns this group maintains focus on looking for vines to spawn and doing DPS to BT. The moment a vine spawns the boss gets a small damage shield. That shield doesn’t go away until there are no vines on the battlefield for 3 seconds. If after 10 seconds there is still a vine on the battlefield then the damage shield becomes more powerful. It will continue to grow in power every 10 seconds until the battlefield is clear of vines. This single aspect of the encounter can be the reason we fail the raid – if the damage shield is allowed to harm our dps and kill them, and even curse them then we will not have enough dps to kill the 5 star efficiently when spawn. Once again, the vines not dying immediately on spawn can cause us to fail. The vines have 13.5k HP each and a spawn time of 2-3 minutes. Appointed Raid leader will appoint group leaders. Group leaders will ensure that proper groups are formed according to the Group Composition instructions, report any shortages so we can spam clan chats on line. Once groups are formed we will get everyone into position along the West side of the battlefield. All range DPS need to report to the Northern corner. Raid Leader ask if anyone is not ready. Remind everyone to turn down graphics to reduce lag, turn off symbols, etc. Tell the clan not to use clan chat unless its something specific related to the raid. Main Group goes in at the west platform and engage bloodthorn taunting. It is ideal to have buffs casted on tank during the countdown. Vines group goes in at the word ‘go’ and each DPS kills the assigned vine(s), South tank pulls South 5 star so dps can kill Southwest vine. Once cleared the South and East lvl 228+ rangers find their sweet spot just outside of agro of the south 5 star and the South tank resets the add. North Tank group and DPS groups run in on the word ‘go’ and attack from the North position. 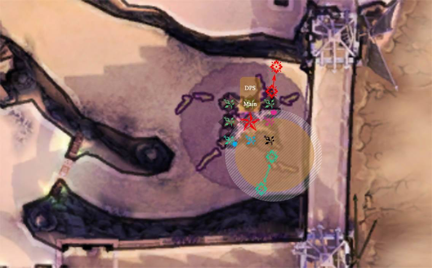 North Tank position where the North add spawns. Bashers bash the regrowth ability. As soon as vines spawn, vine group kill them on sight. As soon as 5 star spawns DPS groups kill it on sight. NO ONE should be in the agro radius of the South 5 star root at any time during the encounter except for the South tank and the assigned vines group personel.  On Black Vine Spawn, OT South aggros and drags south add South Add to Southern limit. Vines group kills and leaves South Add Aggro Radius.  Vines Group kills vines on sight. Pink and Blue Rangers kill respective vines, continues DPS on Bloodthorn in mean time.  On North Add spawn, OT North will engage and begin tanking. (3:37 recorded Add respawn time, probably a range between 2:30-5min.) All members of DPS Groups change focus to North Add until dead. *Dedicated Vine contingent remain on Bloodthorn, continue to kill vines.  As soon as North add is killed, ALL DPS Group returns to attacking Bloodthorn from North Center vine position.  With Approximately (40%) Health, Bloodthorn will periodically create a poison cloud on one of the eight platforms. Move as necessary if it lands on your platform from North Center to West Center and back due to poison clouds. Druids should not be directly on a platform. - Raid Leader send periodic reminders for using potions of purification, relixing, and make sure to call Add Spawn and type of add. It is imperative to burn the north add down extremely fast each and every time it spawns. Main tank group and the dedicated vines players should be the ONLY players who do not switch from Bloodthorn to North Add. Chaosroot Note: Not many things will outright crush our raid force, but a 25k+ DD can cause a wipe easily. Ranged DPS within DPS Group should maintain their distance to stay alive easily for tier 1 (1-40 seconds) and take minimal damage for tier 2 (41-80 Seconds). Druids within DPS Groups should use their book at the end of Tier 2. Although Tier 3 can be very damaging, Chaosroot under no circumstances can be allowed to survive to tier 4. Main Group should be aware when Chaosroot is up, cycle books until it is killed. This boss has a soft and hard Rage. Initial rage is similar to any other bosses rage, the boss hits harder. At approximately 45 seconds (Guess) the boss starts healing itself about 25 percent every 45 seconds. Ask if Main Group, North OT, or South OT requires you. Else, join a DPS Group and save lives. Are you a single device user? Are you a multiple device user? Ask to join a DPS Group. Ensure all roles in OT North, OT South, MAIN Group tanks are filled. Bloodthorn Raid Leader Guide – should probably be a DPS toon. -	Ensure that the Tank group has 4 Druids minimum and a support rogue. -	Tell all mages and DPS Druids to group together. Ideally we have at least one full group of caster DPS, the more the better as Casters aren’t effected by the vine damage shield. -	Before we begin ask everyone if they have their potions. Ask if anyone is not ready. Remind everyone to adjust graphics to reduce lag and to turn off symbols. -	Remind them that killing the vines on spawn and killing the north 5 star on spawn are the two most crucial aspects of this raid. Tell multiloggers to make sure their dps toons change auto attack focus to the 5 star immediately upon spawn. -	Tell everyone to lix up then tell the north tank to pull the north add and have all range dps burn this add to the ground. -	Tell everyone to take a potion and then start a 5 second countdown and shout go. o	Vines group should be killing vines and positioning themselves to DPS and kill vines immediately upon respawn. -	Be attentive to timers, and boss health, and the how quickly vines and North root are dying. You may have to pull an extra person onto vine duty to ensure vines die immediately on spawn. o	Call out potion reminder when 30 seconds left on potion of purification. o	Make sure the 5 star call is being made immediately upon spawn. o	When boss gets below half health then tell clan to be ready for poison pools. o	Remind to relix at 14 minutes. o	When consuming the third potion of purification if the bosses health is not below half consider resetting the raid. DPS becomes a little slower when the poison pools spawn because of the fact that people have to make adjustments and we have multi loggers. If we haven’t got him below half chances are we aren’t going to kill him. The first few attempts it may be good to let it go all the way to Rage so we can get experience. Q - How do you tank the South Root, are you sure one Druid is enough? A - Perhaps calling it tanking is misleading. The strategy is to simply pull the agro when needed. The picture that is posted of the battlefield outlines the South Roots agro range (credit to Praetorian V of Relentless for the picture). THE H3ALER of Mabon informed us that if you leave the South Root up he will stay at T0 and you only have to overcome the immunity he provides and the heal that the boss casts off the root. It was discovered that the Regrowth spell that the boss casts is bashable (yay bashing tanks have a roll again). So it was decided to leave the Root up. We found that a lvl 228 + has a smaller agro radius than other toons on the root. So by assigning two 228+ rangers to the south vine and the east vine the South Root would just sit there at T0. When the SouthEast vine spawns these rangers call out "PULL" in clan chat. the South tank who is sitting to the south outside the agro range then runs forward just enough to agro the root. The root then runs to attack the Tank. The rangers quickly kill the SE vine then get back into position. Once the rangers are back in position the South Tank simply leaves the agro range of the Root and allows the Root to stand there watching his beloved Bloodthron get murdered. Also we don't need to use a druid now that our tank has a higher tier of poison resist on his shield.